Anyone know anything about the Tonkawa unit 1 H located in far northern Colorado county. Everything is so quiet. This production data shows that in the Month of July that it produced 48,161,000 cubic feet of gas with minimal amount of concentrate…I suspect this well was completed into the Austin Chalk…EOG does not show a Completion Report at this time, just a Well Record. 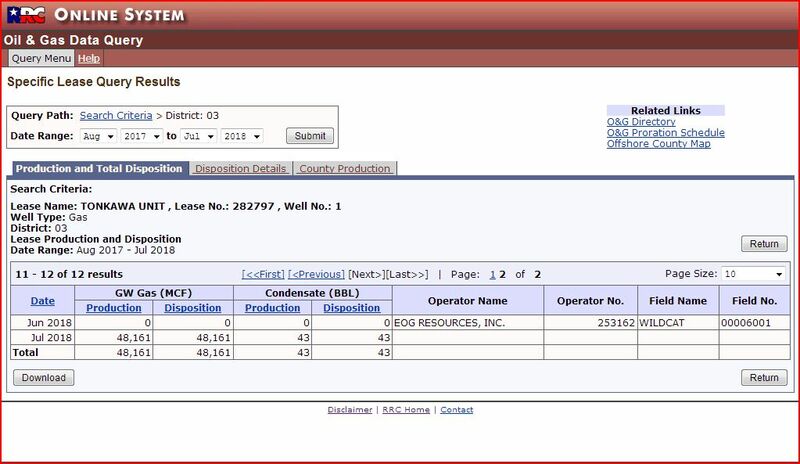 So it’s producing at this time over 1 million cubic feet gas per day…Lease # is 282797/gas well. Only produced for 3 days in July…that’s 16mmcfpd. From what I’d heard think you are right and that those few days were just a test run. Possibly shut in and more completion work done since then. Curious how you know that was 3 days production? Also interesting that they’ve installed a large tank battery if that well only makes 43 barrels of condensate with that much gas. I think I heard that from some of the locals and the fact that they reported 0 production for August gives it credibility. Probably a 3 day flow test for potential and now they are waiting on market/pipeline. Heard they are going to bring production from Shelby area down to Tonkawa location and then over to Ellinger, but not sure. Thanks. If you haven’t seen it, several of us have been sharing information on Tonkawa under heading of Pallas Energy. Appreciate when you can pass on any more information. Learned the other day they have a new drilling location staked out to the east of the Tonkawa perhaps a half mile. It’s just outside the boundaries of the Tonkawa unit. Do you think if this wildcat is a success they are going to form a new unit designation to the east southeast of the Tonkawa unit or just make the 1,240 acre present unit larger. More than likely they’ll form another unit. 1240 is about as big a they get. It depends on what their leases say and what the field rules from the Texas RR Commission will allow. Also on the original discussion page a person said that they have revised those figures and refiled it to have produced 92,000 mcfg . If that’s correct isn’t that a truly phenomenal amount of gas in such a short time period? That would be twice as much as previously reported. Good rates but still probably for a limited period. I checked the railroad commission this morning and they are still reporting the well as shut in. The only production on record is the 48,000 mcfg reported over a 3 day period in July. 16,000 mcfg per day is definetey an economic rate. Jackson if you go back to the original forum under PALLUS you would see the final post from Reeves rancher that those numbers were revised. IDK this well would be a great backset for a soap opera every day you be coming back for more. Kinda fun following it thou. I’m posting this here because the other PALLUS site has been shut down. Anyone know why?? Don’t know why they closed the other page. I’ve asked about others that got closed and later reopened but never got an answer. Maybe more folks will see this topic and have something to contribute. Hopefully all that history about the Tonkawa that’s on the other General Discussion page won’t be lost. It least it still pulls up if you search for Pallas. I’d definitely appreciate somebody pointing it out if there is a way to use that tracking number, other than entering it on the page where RRC normally shows any completion reports that have been filed, and more information is available. Otherwise I’ve got to assume this is just EOG continuing to hide the ball on what they are doing there. I passed by the Tonkawa CDP right after lunch it’s got a great pinging and hissing rhythm going. Kinda “healthy” sounding. Lol let’s hope it continues. Since I guess this is our new place to talk, wondered if are seeing any signs of crude being trucked from the Tonkawa, or heard any more about the possibility of that second new pipeline? Dusty 1 I’ve seen tankers and they weren’t saltwater tankers but shiny ones coming out of both the wellsite and the CDP you think it’s possibly the condensate? Also a person who lived nearby said that when they first flared it upon completion it flared unbelievably high so I guess it has great pressure.